Your allergy-ridden dog may reach a point in his life when steroids are necessary to free him from painful itching and inflammation. But steroids can cause problems. If steroid administration is unavoidable, work assiduously with your veterinarian to monitor and mitigate any potential side effects. Nonsteroidal alternatives may reduce or eliminate the need for steroid therapy. Frequent baths in a citrus-based shampoo can bring relief to your dog's itchy skin while drowning fleas. When a dog is exposed to environmental toxins, vaccinations, parasites or food allergens, his immune system goes into high gear. His other organs, such as his skin, will even pitch in to aid overworked liver and kidneys, causing hot spots and other physical manifestations. Steroids -- synthetically enhanced corticosteroid hormones -- block immune system responses to the toxins that are overworking the system, giving relief from symptoms. But steroids do nothing to address the toxins. Even with the lowest effective steroid dose for the shortest possible duration, a dog may seem hungrier, thirstier and more tired, and may pant more. A previously latent infection may suddenly appear. Long term, a dog may gain weight while becoming increasingly weak; may develop a urinary tract infection; may have skin and hair issues; may not easily recover from scrapes and cuts; and may develop long-term illnesses. If steroid treatment is necessary, it's crucial to work to mitigate the toxin load to reduce or shorten the steroid course. A class of drugs called NSAIDs, or nonsteroidal anti-inflammatory drugs, is preferred over steroidal medications for pets, when possible. NSAIDs include aspirin and ibuprofen, as well as various prescription-only alternatives a vet will prescribe. Rimadyl is a common one, prescribed for pain and inflammation. NSAIDs also reduce fever. The drugs have similar effects to those of steroids, including depressing eicosanoids that transmit signals to the brain. Reducing your dog's exposure to toxins both internally and externally may alleviate issues that typically call for steroid treatment. Review your vaccine protocol with your veterinarian to see if you can eliminate any. Spacing individual vaccinations may reduce stress to your dog's system and allow you and your vet to determine whether the dog is having a negative reaction to one specific vaccine. Your vet can also do a titers test on your dog for certain vaccines to determine if he still has protection from his last vaccination; he won't need another dose until that protection is no longer effective. Take a chemical inventory of your pet's environment. Reduce or eliminate lawn and household cleaning chemicals, and try natural flea and tick preventives: Rub a lemon or orange on your dog's coat to repel fleas; bathe and brush him frequently; clean his bedding and living area daily. Rose geranium essential oil may help repel ticks; dressing him in a shirt and socks while outdoors can reduce tick exposure. Purchase beneficial nematodes at garden or pet stores to naturally reduce the flea population. Your dog's best defense is a healthy gut. Low-quality dog food is highly processed; some of it is made overseas where manufacturing and ingredients standards are low. The dead stock that some dog-food makers add may be riddled with harmful bacteria. Some added grains, such as wheat, can include mold toxins. You may notice a significant difference simply by switching to a high-quality or organic food. Adding probiotics will help balance your dog's digestive flora so bad bacteria don't strangle the essential good bacteria fundamental to his immune system. You can easily obtain a number of supplements that can support your dog's immune system in its fight against allergy-causing toxins. Try adding a fatty acid supplement such as primrose or fish oils. Vitamin C inhibits the release of histamines that cause allergy symptoms, and quercetin and hesperidin also contain antihistamine compounds. Antioxidant supplements to try include grape seed extract, vitamin E, beta carotene and alpha lipoic acid. They are available in supplement or herbal sections of pharmacies and grocery stores. L-Gluatamine, bovine colostrum and whey protein isolate help heal and support your dog's digestive system; you may need to visit a specialty health food store to purchase these, or consult a holistic veterinarian. Licorice is a plant-based supplement, unique as a steroid alternative because it contains a chemical structure called glycyrrhizin, which is similar to naturally occurring corticosteroids that therapeutic steroids replicate. It works similarly to steroid treatment but without damaging a dog's immune system, and can be used in conjunction with a lower dose of therapeutic steroids. You can also purchase licorice topical salves for skin relief, or use a tea, oil or tincture. Work with your veterinarian on dosage; too much for longer than two weeks can cause sodium retention and accompanying swelling, high blood pressure and potassium loss. Try adding dandelion leaf to replace lost potassium and to serve as a diuretic. Steroids are ingestible, injectable or topical. But many nonsteriodal topical products are on the market. A topical treatment won't address your dog's underlying allergy causes, but it can provide nonsteroidal relief. Ask your veterinarian about shampoos, rinses, lotions and sprays made specifically for itchy skin conditions. A lime sulfur dip can control many itchy skin problems, but it is malodorous. Also try witch hazel, and pure aloe vera gel. Ask your vet about topical steroids; side effects from skin absorption seem to be minor. 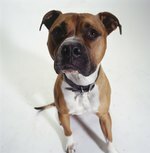 Your vet may have a standard antihistamine protocol he regularly tries before advocating steroids. If you try dietary and lifestyle changes and see improvement, adding an antihistamine regimen may provide enough effectiveness to forgo steroid use.